When it comes to a romantic evening out on the town for Valentine’s Day, there is no better place to be than in Downtown Orlando. From the modern and upscale restaurants, to the swanky clubs and wine bars, to finally Lake Eola Park with the downtown high-rises lit up as the backdrop, Downtown Orlando seethes with charisma. This is Orlando Local Guide’s Top 10 Romantic Restaurants in Downtown Orlando for Valentine’s Day 2016 including Lake Eola and Thornton Park. #1. Kres Chophouse – Church Street is known for it’s night clubs that are open late into the night but with the new Amway Center opening on Church Street in 2010, it is also the hottest place for new restaurants to open as activity is rolling. Kres Chophouse has been open for a few years now as it is now a proven upscale steak house that you can frequently spot Orlando Magic and visiting team players. Located in the historic Kress building that has been in downtown since 1935, Kres has a look and feel of a modern night club, but the food will delight any valentine’s date to keep you coming back for more. Before or after dinner at Kres, catch a movie at Downtown Orlando’s movie theater showing first-run movies. #2. Amura Japanese Restaurant – For great sushi, steaks, and tempura, Amura is one of the best Japanese steakhouses in Orlando. Zagat rated as one of the world’s best restaurants in 2009/2010, Amura also has restaurants in Lake Mary and Dr. Phillips (Restaurant Row). The downtown location is the smallest of the three locations but the quality of the sushi is great all around and has a very loyal following with downtown patrons. #3. The Rusty Spoon – The Rusty Spoon is Downtown Orlando’s answer to The Ravenous Pig in Winter Park. As we were first introduced to the gastropub concept with the Ravenous Pig in Winter Park, The Rusty Spoon opened up their doors in 2011 and serves dishes made from scratch with organic products in an upscale pub-like atmosphere. The space anchors one section of the 55 West apartment complex on Church Street in Downtown Orlando. Start off with with their Haystack appetizer of shoestring potatoes with three sauces and then have a main course featuring their Pork Americana that consists of a cornflake crusted pork served with grits, wilted greans & bacon gravy. Another option istheir Lake Meadow Cornish Hen that is served with smashed sweet potatoes, herbed brussel sprouts and au jus. #4. SoCo – When you talk about romantic dining in Thornton Park, the restaurant space at the intersection of Summerlin and Central comes to mind as a restaurant named HUE opened in 2002 and help to revitalize the area around Thornton Park and Lake Eola. New for 2015, the space formerly known as HUE has been transformed into SoCo that is an acronym for Southern Contemporary Cuisine. Some of the unique menu items at SoCo include Grilled Meatloaf on Lobster Mashed Potatoes, Lake Meadow Naturals Korean-Style Fried Chicken, and Pecan-Crusted Carolina Fluke. Sides include Slow-Cooked Collard Greens, Baked Cheddar Grits with Andouille Crumble, and Buttermilk Biscuits. #5. Shari Sushi Lounge – Directly next to HUE is Shari Sushi Lounge. Just as sleek and modern as HUE next door but in a smaller space, Shari’s signature items include their Jalapeno Pepper Hamachi, Volcano Roll, and Japanese Buffalo Lobster. Shari’s sushi was voted best Sushi in Orlando Magazine in 2005, 2006, and 2007 and is the second best restaurant for sushi in the Magazines Readers Dining Awards 2009 after Amura. #6. Dexters – Dexter’s is a tried and true restaurant in Thornton Park that is a favorite with the locals to see and be seen. It is also a great place to spend valentine’s day. Occupied in a space originally held by the first Publix Supermarket in downtown Orlando that is paid tribute to by a large black and white picture over the bar, Dexter’s is an open restaurant that can be pretty loud at times with local artist’s paintings on the wall to purchase. Duck & Pork Cassoulet, Pan Roasted Mahi-Mahi & Pepper Jack Grits, and Char-Grilled Mojo Marinated N.Y. Strip Steak are all on the dinner menu. Dexter’s also has a great selection of wine. Dexter’s also has sister locations in the Hannibal Square district of Winter Park and in Colonial Town Park in Lake Mary. Before or after dinner, take a stroll down Washington Street to take a walk around Lake Eola. #7. The Boheme – The Boheme is a AAA Four-Diamond restaurant in the posh Grand Bohemian Hotel in downtown Orlando that was, until recently, a member of the Westin brand of hotels. In walking distance of Orlando’s Nightclubs and Bars on Orange Avenue, the Boheme provides a classic and inviting experience with live music on the piano. Spend the night at the Grand Bohemian and book one of their spa packages for a romantic weekend and walk to the Magic playing the Atlanta Hawks at the Amway Center on Wednesday, February 13th, 2013 the night before Valentine’s Day. #8. 310 Lakeside – 310 Lakeside is the sister restaurant to the original 310 Park South in Winter Park. The 310 stands for the street address of the Winter Park location that was copied over to the Downtown Orlando location. The Orlando location took over a Sam Snead’s restaurant at the lobby of the American Momentum building on Central Boulevard and serves high quality American fares. 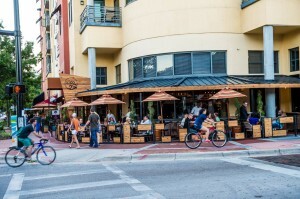 You can dine al fresco along Central Boulevard across the street from Lake Eola if the weather is warm enough or sit inside that wraps around a bar with open windows to the street below. Start off with Gator Tail or Crab Cakes as an appetizer and Filet Mignon or the New York Strip for your main course. Make reservations for the SAK Comedy Lab in walking distance after your meal on Orange Avenue for some Improv Comedy fun. # 9. Citrus Restaurant – Between the core of Downtown Orlando and Lake Ivanhoe is a section of the city just north of Colonial Drive where Downtown Orlando has had a lot of growth that is now called Uptown that has two romantic restaurants that make our list for best restaurants for Valentine’s Day. The first restaurant, Citrus Restaurant, won Orlando Magazine’s 2010 Dining Award for Restaurant that Best Says “Orlando” and also for Best Power Lunch. Outside of lunch, Citrus serves Florida Snapper, Florida Shrimp & Grits, and Filet Mignon. Please see the Google Map below the video for a mapping of all of the restaurants covered above. This entry was posted in Restaurants and tagged date night, downtown orlando, february, holidays, lake eola, orlando, thornton park, top ten, valentines day. Bookmark the permalink.